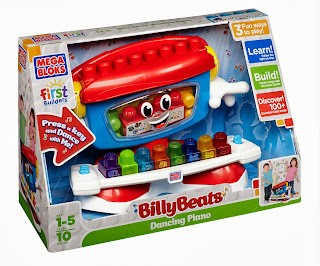 Ever since I was a MEGA BLOKS mom awhile back, we have been big fans of the brand. It seems like they are always coming out with innovative ways to foster open play, and with the introduction of music to the mix, they've captured the heart of my 3-year-old Marcus! The Mega Bloks First Builders Billy Beats™ Dancing Piano combines a functional electronic piano, Mega Bloks building blocks, and a fun, dancing character into one unique toy. We usually steer away from battery-operated toys, but this one really has lots of ways to play, and my toddler has not really stopped playing with it since we got it! As you can tell from the photos, the "piano" holds building blocks inside his head. He also sways from side-to-side while playing tunes that the child picks by their choice of "key" on the keyboard. The keys can also be used to stack blocks, and this toy is compatible with all of the First Builders blocks from Mega Bloks (even the ones we purchased over 10 years ago!) There are three modes of play, as well, that allow children to play the Cool Piano, Whacky DJ and Funny Animal sounds of their choice. While my son is just 3, and doesn't try to play the music lines that are included on the blocks themselves, older children can actually play back tunes based on the colors. It's a great first start to a lifetime of music appreciation! (And the volume button is a blessing for moms that want to "keep it down" in those afternoon hours.) The toy comes with 8 blocks and batteries, too! You can learn more about this toy at the official product page. *Prizing & samples courtesy of Mega Bloks. Opinions are 100% my own.